NYC, 04/20/2019, 6:30PM. 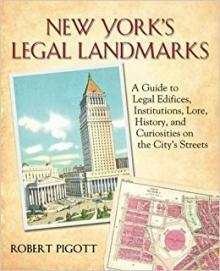 New York's Legal Landmarks: A Guide to Legal Edifices, Institutions, Lore, History, and Curiosities on the City’s Streets. New York’s Legal Landmarks takes you on a tour of Gotham through the eyes of a history-loving New York City lawyer. You’ll visit courthouses past and present that were sites of sensational trials (both actual and in film), locations that figured in the nation’s constitutional history, law firms where great Americans practiced law and the homes, schools and final resting places of Supreme Court Justices. Whether you want to stroll down the Lower East Side’s Attorney Street or re-open the cold case of Judge Crater’s disappearance, New York’s Legal Landmarks is the guidebook for you. With Robert Pigott.